To aerate something means to add air to it. Really, all concrete should have some air added; it's one of the basic ingredients. Some concrete needs to be lighter and less dense and will require more air, while concrete used for very solid structures, like foundations, should have less. Sometimes the components of concrete will dictate how much air can be added to the mixture. To have full control over the aeration of your concrete, mix it yourself from scratch. Improperly prepared concrete may crack or break later. Choose and rent an electric concrete mixer that has a mixing barrel appropriately sized for the amount of concrete you will need. Place the mixer on a flat surface near the location where you will be using the finished concrete. Examine the interior of the barrel and ensure that it is clean and dry. Divide the amount of dry concrete mix you require into 6 parts. This will tell you how much 1 part is for your particular project. Since the amount of concrete needed for different projects varies greatly, the recipe is given in parts rather than hard-and-fast measurements. Put on a pair of safety glasses. Scoop 1 part of cement powder into the barrel of the mixer with a shovel. Transfer the powder slowly to avoid causing a dust cloud. Measure and add 2 parts of your chosen fine aggregate to the barrel of the mixer. Again, move the dry ingredient carefully. Turn the barrel of the mixer on its lowest setting and let these ingredients combine well; turn off the barrel again. Put 3 parts of your chosen coarse aggregate into the barrel atop the existing mixture. Turn the barrel on low again. Wait for the dry ingredients to combine. Slowly add water to the dry concrete mixture as it spins in the barrel. 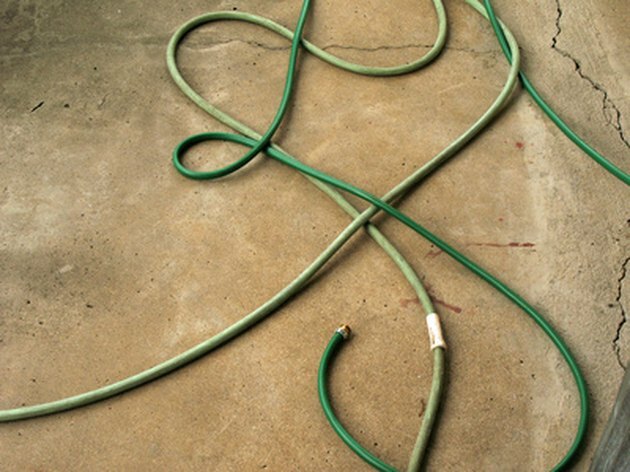 A garden hose generally works well. Stop adding water when the texture of the concrete is like slightly melted peanut butter and is consistent throughout. Let the mixer continue to spin for approximately 20 minutes. During this time, air is being pulled into the barrel and added to the mixture. Stop aerating the concrete after 10 to 15 minutes for a denser product.